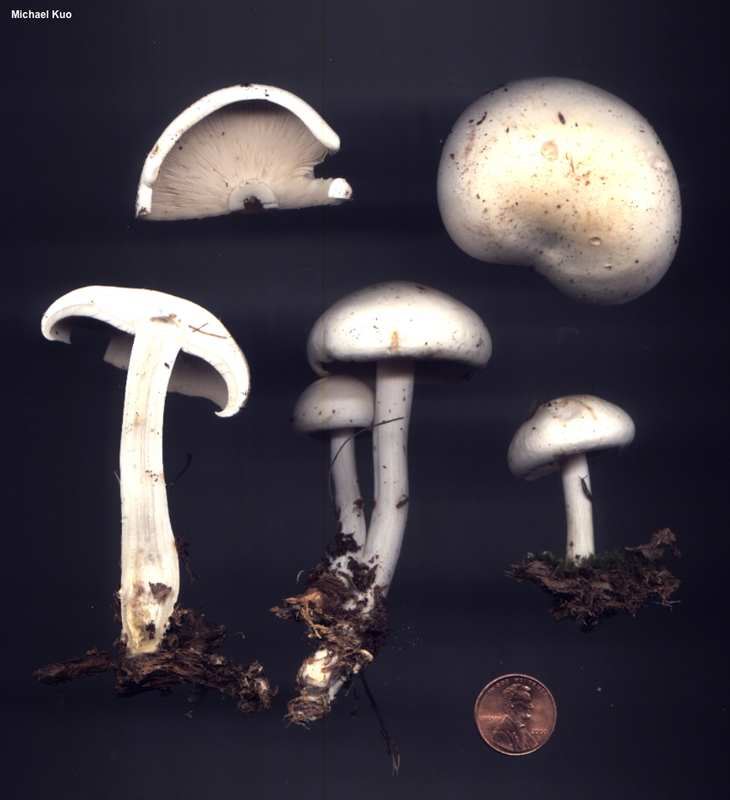 This small to medium-sized mushroom is recognized by its whitish cap, which develops cinnamon spots and stains as it matures; its very crowded, attached gills; its ecology (decomposing the wood or litter of conifers); its bitter taste; and microscopic features (see below). 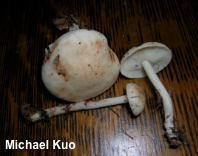 Many varieties of Rhodocollybia maculata have been described, based on morphological differences. The best known and most widely distributed of these is Rhodocolybia maculata var. 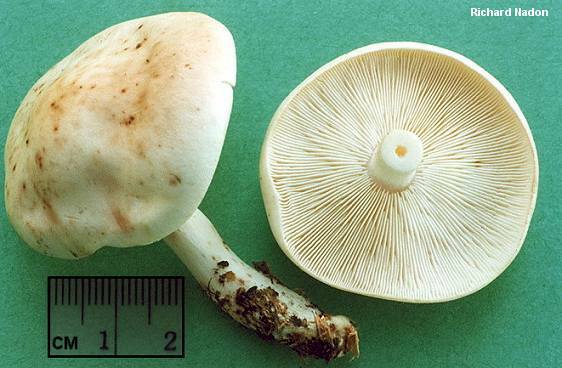 scorzonerea, which features yellowish gills that are not nearly as crowded, and a yellowish cap and stem. For discussion of, and keys to, North American varieties, see Smith & Hesler (1943) and Lennox (1979). Ecology: Saprobic; decomposing the deadwood or litter of conifers; spring (in warmer climates), summer, and fall; widely distributed in North America. The illustrated and described collections are from Illinois, Michigan, and Québec. Cap: 2–6 cm across; convex, becoming broadly convex or nearly flat, with an inrolled margin; dry; bald; white to whitish, developing cinnamon spots with age, or sometimes very pale tan; the margin not lined. 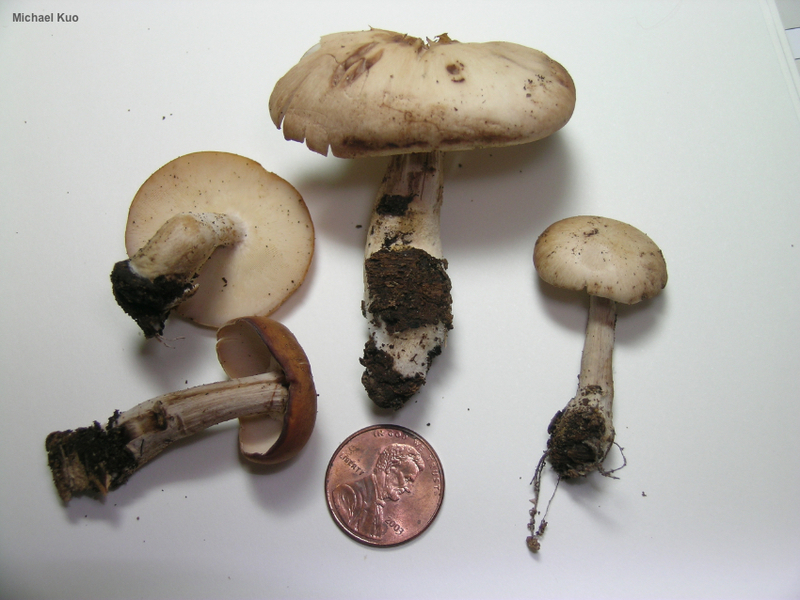 Gills: Narrowly attached to the stem; very crowded; short-gills frequent; white; sometimes developing rusty spots with age. 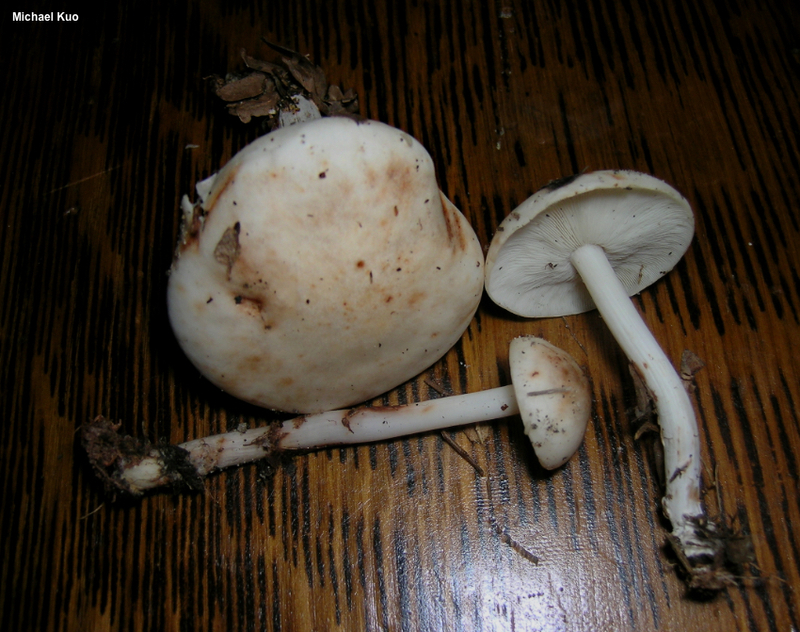 Stem: 5–7 cm long; 0.5–1 cm thick; equal, with a tapered rooting portion; bald; white; sometimes developing cinnamon to rusty spots with age; basal mycelium white. Odor and Taste: Odor sweetish, or not distinctive; taste slightly to moderately bitter. Chemical Reactions: KOH negative on cap surface—or dull olive on darker caps. Spore Print: White or, in a very thick, fresh print, slightly pinkish. 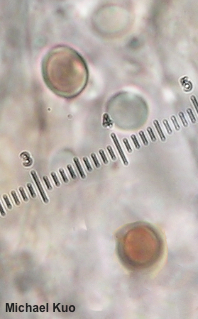 Microscopic Features: Spores smooth; 4–6 x 4–5 µm; subglobose to very widely ellipsoid; with a prominent apiculus; smooth; hyaline in KOH; some inamyloid, but at least a few (often many) usually dextrinoid. Basidia 4-sterigmate. Pleurocystidia not found. Cheilocystidia 20–35 x 3–5 µm; cylindric to clavate or irregular, with branching or subdigitate processes; smooth; thin-walled; hyaline in KOH. Pileipellis at maturity a cutis of cylindric, clamped elements 2.5–5 µm wide; smooth; hyaline in KOH; exserted ends cylindric with rounded apices. REFERENCES: (Albertini & Schweinitz, 1805) Singer, 1939. (Fries, 1821; Saccardo, 1887; Kauffman, 1918; Coker & Beardslee, 1921; Smith & Hesler, 1943; Smith, Smith & Weber, 1979; Halling, 1983; Arora, 1986; Phillips, 1991/2005; Lincoff, 1992; Barron, 1999; Roody, 2003; Halling, 2004; McNeil, 2006; Miller & Miller, 2006; Trudell & Ammirati, 2009; Antonin & Noordeloos, 2010; Kuo & Methven, 2014; Desjardin, Wood & Stevens, 2016; Baroni, 2017.) Herb. Kuo 09030207, 09110513, 07061403.